**It is similar to the first one posted here. Last edited by DeathStriker on Thu Dec 06, 2018 12:24 pm, edited 4 times in total. Just as well. Focused on Christmas shopping and events/dinners anyway. Good break till next year. Thanks for keeping us posted! Conflict not an Event - I refer to my previous post, somebody tag it for me. CoolGuy wrote: Conflict not an Event - I refer to my previous post, somebody tag it for me. CoolGuy - Perhaps you speak of your Topic posted here. 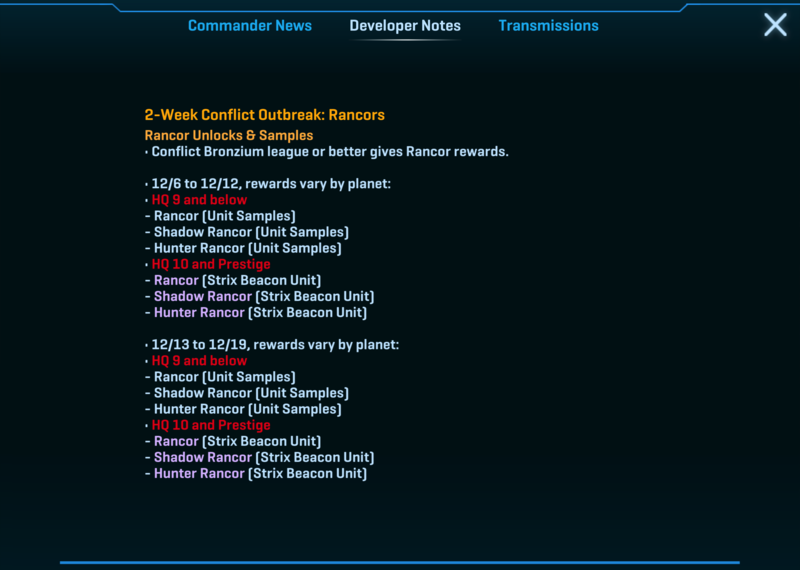 There is "speculation" that following this Rancor Conflict there may be an "Event" to take us through the Holiday Season into next year. Reminder - it was a year ago that they introduced the SWC Event System as I posted here. Is this just going to be for level 10's and 11's again? If so, I'll be starting two barracks upgrades tomorrow. Like the #1 Edition, this is a specific Conflict only for HQs 10 and Prestige, while HQs 9 and below will receive Samples again. Why should I play a week of conflicts attacking like a maniac only for samples? More vacations for my low level bases, as well for my Prestiges. And as after this it matches with holidays -- I think i probably play SWC again only in 2019 if we finally have an Event or something really useful to grind for in the Zynga's era. And I so interested in play SWC that I have my 5 worker droids idle in my Imperial Prestige for 2 days -- I could be attacking Dev bases now to upgrade more 3 turrets, both Dekas and another Prestige building, but I am browsing for new albuns of my favorite bands on the Internet... Maybe after this I am going to produce bananas in my Fruit Farm in Forge of Empires while doing the Winter Event quests.